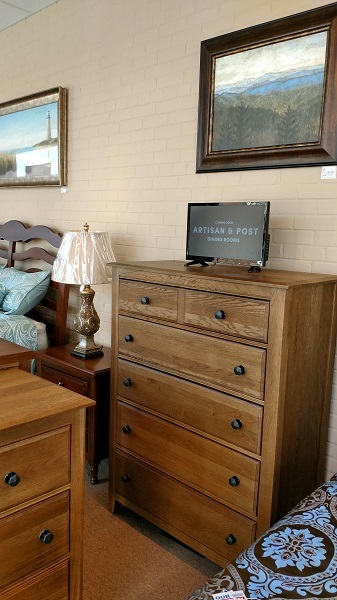 Chests, Mooresville, NC | Gibson Brothers Furniture Inc. Chests, Mooresville, NC | Gibson Brothers Furniture Inc.
Chests are an elegant choice when you need to add to your current bedroom furniture in Mooresville. If you have one or more bedroom sets that are lacking in storage, chests are an excellent option to improve the look, feel and function of your bedrooms. Whether you need to add a single piece or want to purchase a new bedroom set that includes a chest, you’ll find the solutions you are looking for with us at Gibson Brothers Furniture Inc. We carry high-quality furniture for every room in your home, and our selection includes chests that will look beautiful and work well for your specific needs in Mooresville, North Carolina. When you shop for chests and other furniture options with us at Gibson Brothers Furniture Inc., you may find that there are several things that set us apart from a traditional big box store. Not only are many of our furniture brands made in America, but we’ll also work with you ensure that your furniture is delivered to your home safely and securely after your purchase. We’ll even haul away your old furniture if you are replacing an old set. Chests are an elegant choice when you need to upgrade or improve upon your current bedroom furniture, and you won’t be disappointed when you shop with us for the bedroom furniture you need for your home. Contact us or come by our store today to learn more about what makes Gibson Brothers Furniture Inc. you top choice for furniture in Mooresville. We will be happy to point you in the right direction for the furniture that will make your house feel like home.